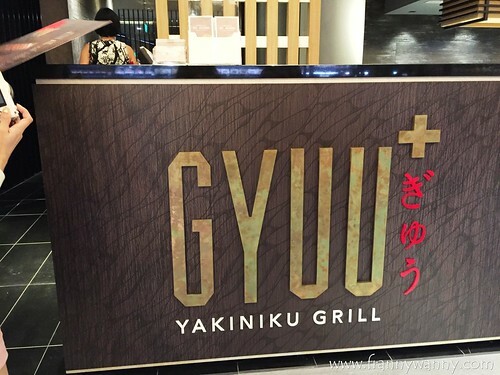 One of the highlights of our visit to Emporium Shokuhin was our meaty, beefy dinner at Gyuu. As you know, Japanese cuisine is not limited to bowls after bowls of ramen, plates of sushi and sashimi or baskets of ebi tempura. 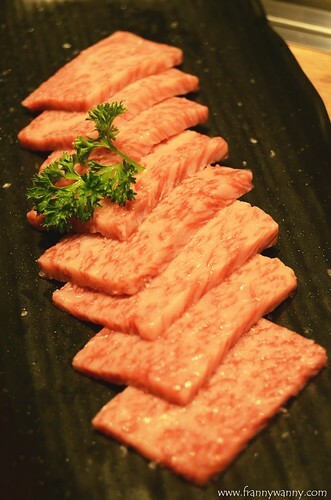 Japan is also know for producing top quality beef that has got the world drooling for years. 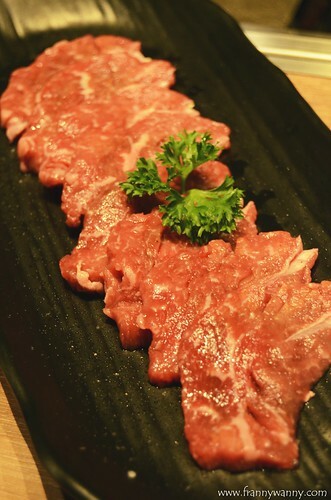 One distinct characteristic of Japanese beef is its amazing tenderness that people would love to describe as the kind that "melts in your mouth". 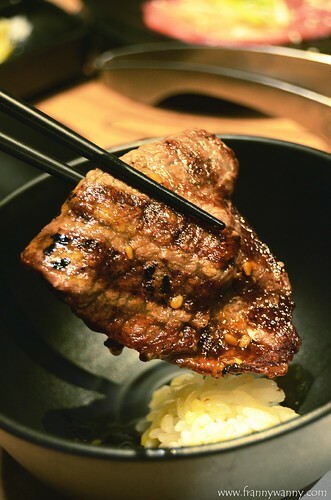 So, when we were told that we will be dining at Gyuu that evening and if we eat beef, I guess our resounding YES! has exposed our sheer excitement for the food to come. 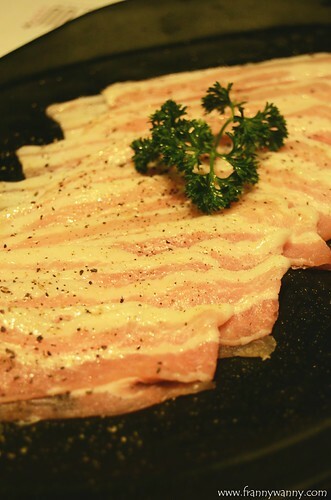 Gyuu specializes in grilled meats and what makes it more fun is that you grill your beef yourself. Okay, maybe if you really do not want to get down and smokey then the friendly kitchen staff can do it for you but I highly recommend for you to go for it as it will complete your dining experience after all. 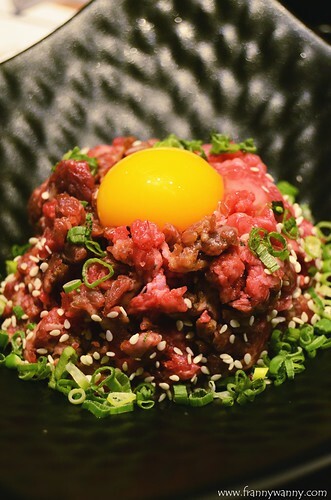 This is the Japanese version of Beef Tartare which makes use of chopped raw beef served with raw egg yolk on top. It would take a while for one to be willing to try raw beef. Don't worry. It was my first time too and I liked it. Perhaps not the kind that I would repetitively order myself but if given the opportunity to try it again, I definitely would. Which is a top grade short ribs which was really tender. It has just the right amount of marbling so it's not the type the "melts" but it cooperates 100% when you bite into it. No struggling required. Meanwhile, the Zabuton actually means "cushion" in Japanese so imagine something so soft (and fluffy? haha). That said, the Zabuton has a higher marbling percentage so one way to distinguish this from the Jo Karubi is the amount of "white" parts it has on each slice. Personally, I enjoyed this more as it was really soft and flavorful which goes so well with a bowl of fragrant Japanese rice. Just to have a taste of the west, we had the USDA Prime Ribeye which was leaner but nonetheless very good too. I love how grilling it has brought out that robust smokiness that there's really no need for any fancy sauce to go with it. Just sprinkle it with pepper and salt and it's good to go but if you must then try the teriyaki dipping sauce that Gyuu will provide you with. 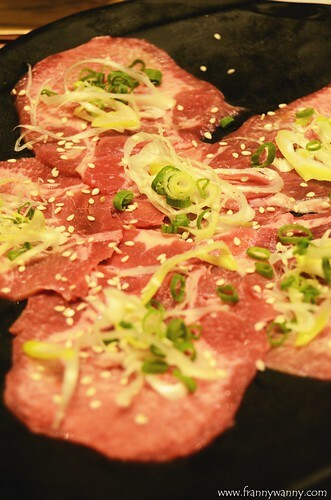 For the adventurous ones, try the Gyu Tan which are thinly sliced beef tongue. I'm not sure if this is exactly the same as lengua / ox tongue but I have to say that this is one "delicacy" that you have to try. Forget where it came from and just indulge! That's basically most of the grilled beef that we had that evening and to balance it out we tried the Pork Belly which are like thinly-sliced bacon! I've been spoiled by the yummy beef slices that the pork definitely paled in comparison. Add to the fact that I'm not really wild about bacon so this was just a-okay for me. I wanted veggies in every meal and I got my wish! 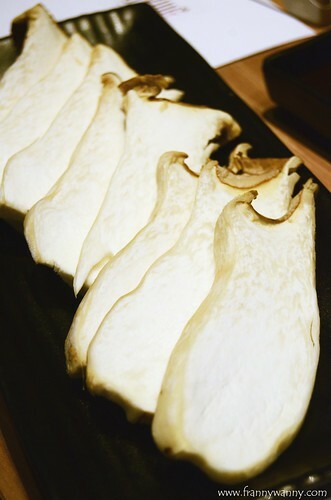 These huge mushrooms are very tender and it goes well with the beef too. For a while there, I was confused. 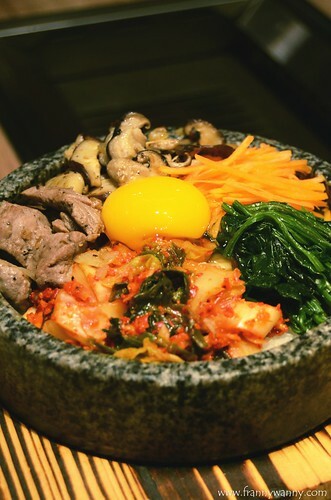 Bibimbap? In a Japanese restaurant? But hey, Korea is just a few miles away from Japan so who knows right? After all the Korean Kimbap looked so much like the Japanese Futo Maki. Also, the flavorful rice went perfectly well with all the choice meats that we had that evening so why not?! The only thing missing was the hot red sauce that we mix into the rice. Nonetheless, the minced beef was plenty, so were the strips of veggies and of course the serving of Japanese rice underneath. We had a fun dinner cooking and eating at Gyuu! 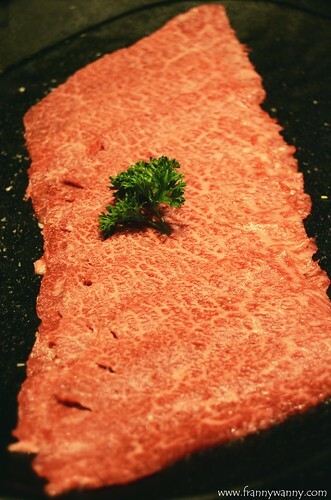 If you notice, the prices here are surprisingly very reasonable given that you're getting top quality Japanese beef. I think we need to go back for our 2nd visit soon. Gyuu is located at Emporium Shokuhin, 6 Raffles Boulevard, 01-18 Marina Square, Singapore, 039594.